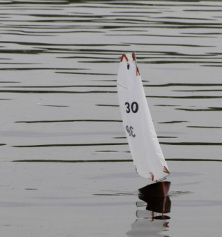 .... a small radio-control sailboat whose length is a mere 12 inches (30.5 cm). The hull can be made from a fiberglass mold or simply with thin sheets of balsa wood fitted together. Two servos are used, one to control the sail and one for the rudder. Some free plans are available. See the Footy types & our extensive "How to" pages. 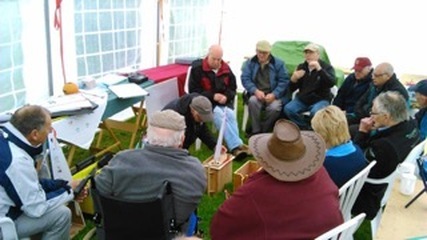 The Footy class is a development class which means that anything not strictly prohibited by the rules is allowed, it has a growing following in the UK and is now an affiliated class of the Model Yachting Association of Great Britain. To keep competition keen, the Footy designers have proposed a set of rules to keep all the boats similar to a certain degree. Visit the Rules page for details. Raced at a recent Open event? Check out ACERSAIL to see how you or your club are doing in the lists. Once you have completed your Footy or are near to completion UK Footy builders can fill out the registration form to register your boat here, this will ensure that your details are recorded with the UK events organiser where upon you will receive prior notification of the UK Footy events. The Footy Class now has so many registered skippers that we were having difficulties with our regular email account and recently moved over to a bulk email provider. If you are a registered Footy Skipper and haven't been recieving our notifications by email you can subscribe by following this link. You will be asked for your hull registration number on the form. With the change in format to include the wider Footydom, the 2016 Champions League kicked off in fine style with a Frensham Pond MYG recording the first set of results for their skippers towards the overall competition result. 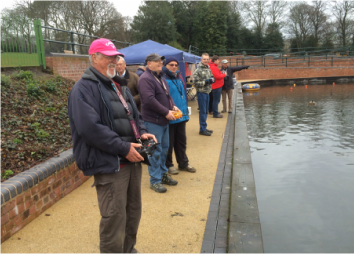 Not to be outdone Birmingham MYC held a first Winter Series event in January with club skippers registering their first points . Has recently published an article about building the Fat Boy Slim, to find the further details referred to within the article please click here. Footnote - long time supporter of the Footy Class, Charles Smith the editor of Acquaint, is stepping down from this role. Those of us who have rubbed shoulders with him at Footy meetings know him as one of life's gentlemen and I am sure the entire class wishes him the very best for the future. The Acquaints loss is Turning Pole's gain. The Nov"ICE" competition will be running once again in 2015 as Roger has agreed to supply another ICE as a prize and we are able to provide trophies for Novice winners at each of the Footy Opens this year. After a brief conversation at this years Mad March Hare with a couple of Footy curious Cheddar Steam Club members and ourselves, we hatched a plan to attend their club and hold a Footy Day, where some of us who are longer in the tooth than others could pass along some of our experience to their skippers. We arrived mid morning to a very warm welcome from the assembled members, after the introductions were all completed we ran a short lecture on the model yacht racing with Footy class yachts which touched upon everything from how it should fit in the box, the basic rules of racing to course setting skills. When Footy Guru Bill Hagerup was asked by the members of Back Bay Skippers Club, Wolfeboro, NH. to design a Footy for their members to build, he came up with the Back Bay "Nipper". 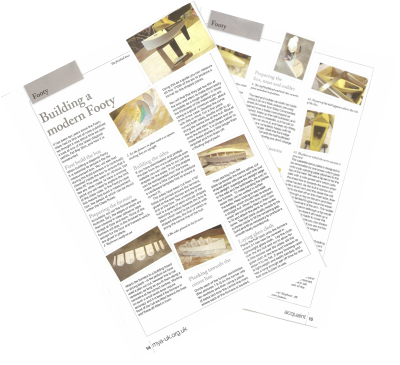 As many of the prospective builders were inexperienced scratch builders he kept it simple but maintained many of the features of the more exotic Footys within these pages, consequently what we have is a simple to build, inexpensive, good performing Footy ideal for builders just starting out. 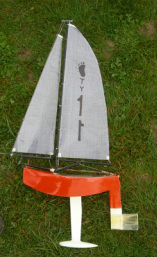 Click the links To see Bill's full build details & sail designs. 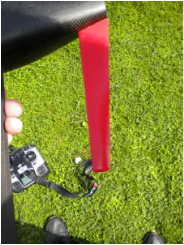 Peter Jackson has recently been using a hull called the Red Box in many of the UK Footy events, the hull is a balsa derivative of the leading Footy ICE design. His results with this hull have been reasonably impressive with many top three finishes this year and a victory in the last round of the Midland Footy League. Peter has now taken the CAD drawing and converted them to a pdf format so that they can be down loaded and printed on A4.